Sixteen and a half years ago, my parents came for their yearly vacation – accompanied (as usual) by my father’s Cocker Spaniel. We all loved Aspen, except my daughter was quite hesitant about him. She would try to pet him, but was always on-guard… quite literally! She had always had a… should I say “hesitancy” when it came to dogs. She had never been hurt by a dog, she simply didn’t feel comfortable when they were around. She always HAD to know exactly where they were. My father felt sorry that she was missing out on the childhood fun of enjoying a family pet. He absolutely NEVER offered any constructive parent-rearing tips or corrections, except to tell us that he thought we should add a family dog to our family, so that our daughter could become comfortable around dogs. We actually added Sprite to our family on one of his trips to visit us… and I can tell you that Aspen was not delighted with having to compete with this little, white fur-ball we had brought into HIS vacation domain. Sprite thought Aspen was the greatest, and wouldn’t leave him alone… even when he let her know he did not appreciate her little razor-sharp puppy teeth excitedly nipping at his big, floppy ears. That was sixteen and a half years ago, and I can tell you that Sprite has been the center of all of our universes since that day. Aspen had to make due with staying in Colorado Springs for the rest of the times my dad visited us, which I know was a hardship on my dad, as he loved that dog a whole lot. Over this past weekend, we had to say our final good byes to Sprite, which is why I haven’t been on the computer these past few days. Because she was not able to go up and down the stairs, or jump on furniture the last few years, I literally took her with me from room to room, always having her by my side or on the couch or bed while I did housework. She was a comfort to me when both of my children moved to college, and has remained a very close “best girl puppy” to me since then. I have tried to work at the computer since we said good bye to Sprite, but I keep looking over to the bed, where she has been my constant companion while I am at the computer for the last few years. I know I wrote about us having to bring my computer desk downstairs so that she would be comfortable on the guest bed while I worked on the computer. It is very difficult for me to sit at the computer without her on the bed. Sorry to hear that. I know how hard it is. Danna I am so sorry for you and your family’s loss. I know how hard it is since my dog died last year on April 2nd. She was 16.5 years old as well. I got her when she was 6 weeks old and she was my constant companion. I really miss her alot. But luckily we have another dog that is about 7 or 8 years old, which is my constant companion now. First night she came to our home she crawled up on my bed and got under the cover like that is where she is supposed to be. Well take care. My heart and prayers go out to you and your family. If you ever need to chat or email – I am here. Danna, my heart breaks with yours – we lost 2 of our beloved feline children over the past couple of months. Please know our love & sympathy are with you during this time. God love her – she knows she was loved and a member of a wonderful family. I am so sorry to hear about the loss of Sprite. Dogs take up a very special place in our hearts and when they leave us, their loss is felt in a very special way. I hope you can find comfort in memories of your many years together. May you rest in peace, Sprite. She may have taken a piece of her family’s hearts to her Heaven but she left a piece of hers with each of you. Take time to heal and then go for another fur baby. There are many in need as well as wonderful puppies that would be so grateful for a home like yours. Thank you all for your very comforting words. I almost didn’t write this entry, because I realize that Sprite leaving us is very small compared to some of the terrible things that happen every day. I am grateful for all of your kind words, and hope that Sprite is now with Aspen and my childhood Cocker Spaniel, Nutmeg. I’ve had cats and dogs on and off throughout my life, but some of them are just special, aren’t they? I’m so sorry Sprite’s not there for you all anymore. Danna, it’s canine children like Sprite, and my feline and canine children that help so many get through difficult days and times. They are blessings to so many, and their passing is never small. Your family gave so much love; in time another fur child will be welcomed into your hearts & home. 16.5 years of a loving family and a wonderful life…you and your family gave her a wonderful gift in that and I know she gave as much to you. I am so very sorry for your heartbreak. I’m am so sorry about your loss of your beloved companion. They leave such an empty spot when they go. I am so sorry for your loss. A friend told me that after they lost their family dog, her father took her outside and they looked at the night sky and he pointed out Sirius, the dog star and said their dog “runs with the stars now.” Your Sprite runs with the stars now and she’s in good company with my Bob, Congo, Timothy, Pearl (a cat, but hey!! ), and all our beloved critters who have gone before us. We will meet them again. Best wishes. Petie said it… the kittens and pups help us through the hard times, which is one reason why parting with them is so very tough! I wish you peace. It’s so hard losing a pet, I hope each day gets a little easier since Sprite’s passing. So very sorry. I know how hard it is. Thinking about you and your family. Sitting here crying at my desk at work, I am so sorry for your loss words cannot express the sadness that is felt. Danna, I’m so sorry to hear about the loss of your faithful companion. My heart goes out to you. Having just lost two beloved pets in six months, I understand how devastating it is. Unfortunately, grief is the price we pay for love. Thank you, ALL, again! My husband is going to move my computer out of Sprite’s bed area (the guest bedroom) this weekend, or the next. He thinks it would be easier for me to use the computer, ETC. I’m so sorry to hear that Sprite has left you to chase rabbits and play with Aspen and Nutmeg in doggy heaven. I hope they meet up with my wonderful dog Buster and befriend him. Maybe they could teach him how to stalk rabbits … he was always completely useless at it on earth! In fact the only rabbit he ever caught was my niece’s fluffy stuffed rabbit! Losing a much loved pet is the same as any bereavement in your life. Some days will be better than others and in time you will be able to think of him without your eyes filling with tears and your heart aching. I remember when Buster was gone, he’d always eaten the end crusts from my morning slice of toast and I couldn’t bear to eat toast for months and months because I couldn’t share the crusts with him. In time it will get easier for you to remember Sprite with love and affection and without it causing you pain and tears to think about him. When you are ready, do consider getting another dog. It won’t replace Sprite, but it will love you and create a whole new set of stories and memories for you to treasure. All dogs really want is to be loved and cared for and from your posts Sprite was certainly loved and wonderfully cared for. I’m sure that there is another dog waiting for your love and affection when you are ready to give it a good home. In the meantime my thoughts are with you and I’m sending a big cyber hug from one dog lover to another. Sorry for the loss of your companion! Sending hugs to you from San Tan Valley, Arizona tonight Danna. I am very sorry that Sprite is gone…you have talked about the precious little thing in so many of your blogs that we are grieving with you. I am so sorry for your loss. I grew up with cats and every one of them has been a cherished member of the family. I could tell them my secrets and know they were safe; I knew if I was upset they would be right there to comfort me, and on some of the darkest days knowing they were there depending on me to take care of them gave me the push I needed to just keep moving forward. Keep a light shining in your heart for Sprite and know that she is now and forever young and strong and free from pain. It is heart wrenching to lose a pet, they aren’t even considered pets but more like people, I could swear they are almost human. 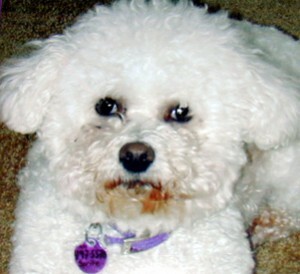 I had a poodle/bichon for about 13 years – that was over 4 years ago and I still miss him. Words don’t work to express how hard it is to lose a part of your family like Sprite. You are in my heart. So sad for your loss. Pets really do become family members. I lost my sweet kitty Honey last year, she was 17 years old and the final two years of her life she was blind and feeble, but still such a sweet, gentle little cat, and I still miss her. Again, thank you for all of the kind and comforting comments. It looks like there are quite a few of us who have experienced the loss of our very special companions. The fact that we all miss them so much sure is a tribute to them! I do know how you feel. One grieves over the loss of a pet because they have shared so many years of our lives and there is always an empty space that only time can lessen. I’ve had basenjis for forty years and as they are rather long-lived dogs, I’ve had my share of grieving. I also read a great deal and love cozy mysteries. Many years ago I read the ones in my grandfather’s library and am happy that many are being reprinted (and made available on Kindle) because the mysteries are as entertaining as any now being written. Gladys Mitchell, Stuart Palmer, Catherine Aird and the Little sisters, (Constance and Gwenyth) are among my favorites from that era, after Christie and Sayers. I was thrilled several years back when Rue Morgue Press began resurrecting the work of these great authors. So sorry to hear your news, Danna. I love to read your blog and always enjoyed hearing about Sprite. It is so hard to say goodbye. So sorry to hear about your loss. We lost our Shar Pei the end of January to a very aggressive and rapidly spreading cancer. From diagnosis until the end was only two weeks. She was such a sweet, gentle girl and we miss her everyday. I do not think I will ever get over our Jin Lei. My sympathies to you. Thank you all, again. When I wrote this entry about losing Sprite, I had no idea that so many of you who had also lost your much-loved pets would write such nice comments. It looks like we all take the loss of our family-member-pets the same way: We miss them fiercely! I think that it means a lot to many of us to see that others have gone through the pain, and have decided that the years of love and companionship are so high that we are willing to open our hearts and homes to another pet.